Hamleys is calling all owners of ‘injured’ teddy bears and soft toys to come along for a mend-and-restore appointment at its Teddy Bear Hospital in Glasgow’s St. Enoch Centre on 5th & 6th March. Enlisting the help of Hamleys’ teddy bear mascots, Hamley Bear and Harriet Bear, as part of Zero Waste Scotland’s forthcoming Pass it On Week to help wee ones’ cuddly bears and stuffed animals to stay in use for longer, the event will allow parents to do their bit to avoid waste. 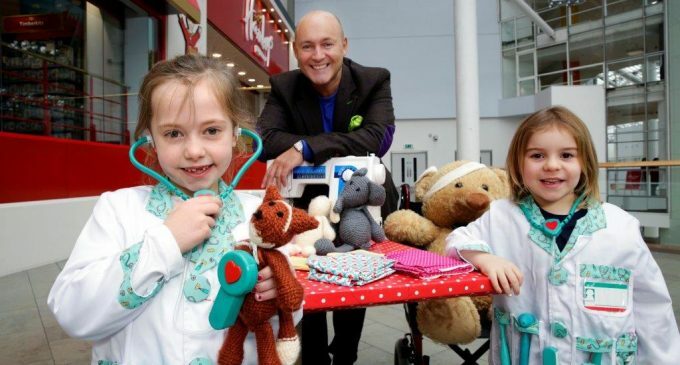 Zero Waste Scotland’s Andrew Pankhurst said: ‘We’re expecting queues out the door of Hamleys and around the St. Enoch Centre as kids and parents make sure the Teddy Bear Hospital gets their teds fighting fit again. Interior design expert John Amabile (pictured), added: ‘Pass it On Week is a fun way to encourage people to keep things in use for as long as possible by repairing, passing on, swapping, sharing or donating their damaged or unwanted goods. The St. Enoch Centre’s Pass it On Week event runs from 5th – 6th March and includes the Teddy Bear Hospital, workshops on 3D printing, Lego-swapping, jewellery-making, sewing, repairing items and fashion shows. For more details, visit www.passitonweek.com.